Your Trustees and Staff with Miami Valley Golf want to thank you, our friend and fellow golfer for making our game so great. We wish you much joy and happiness this Thanksgiving Season. Want a way to give back? Be a difference maker for our next generation? 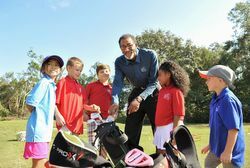 Our First Tee Chapter is looking for volunteers for the 2019 season. If you or someone you know would be interested please share this link. • Touch the sand in a bunker with a club in making a practice swing, in grounding the club right in front of or behind the ball, or in making the backswing for a stroke. This month they feature golf short courses across the nation and right here in Ohio. Plus you'll find our usual mix of great golf travel, news and information.